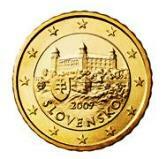 Slovakia applied to join the Euro zone on 5th April 2008 - the Euro becoming the official currency on 1st January 2009. 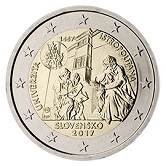 The Commemorative Coins cover mainly historical events in Slovakia's history. Some basic facts relating to Slovakia. 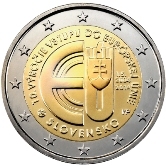 As with many other countries in the Euro zone , Slovakian Euro Coins are devided into three "motif groups"- one for the "copper coloured coins"(1 cent, 2 cent and 5 cent), one for the "gold coloured coins" (10 cent,20 cent and 50 cent) and finally one for the one Euro and two Euro coins. 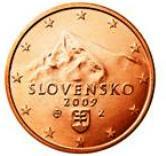 The first motif (1,2 and 5 cent coins) is the mountain Krivan the national symbol of Slovakia. 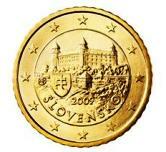 The second motif (10,20 and 50 cent coins) is the castle Bratislava. This is the main castle in the capital of Slovakia also named Bratislava. 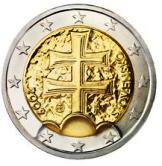 The third motif (1 and 2 Euro coins) is the coat of arms of Slovakia- a double cross resting on a symbolic representation of three mountains. 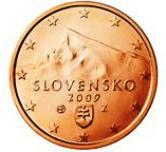 1 cent - the mountain Krivan - national symbol of Slovakia. 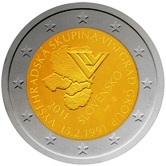 2 cent - the mountain Krivan - national symbol of Slovakia. 5 cent - the mountain Krivan - national symbol of Slovakia. 10 cent - the castle Bratislava- in the capital - also Bratislava. 20 cent - the castle Bratislava- in the capital - also Bratislava. 50 cent - the castle Bratislava- in the capital - also Bratislava. 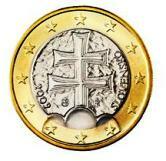 1 Euro - Slovakian Coat of Arms - a double cross resting on a symbolic representation of three mountains. 2 Euro - Slovakian Coat of Arms - a double cross resting on a symbolic representation of three mountains. 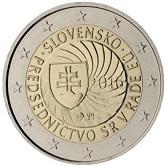 Around the rim of the Two Euro Coin is the inscription "Slovenská Republica" and a Linden leaf between two "*". 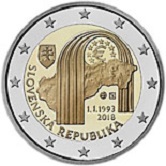 Slovakian Commemorative Two Euro Coins. 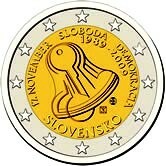 2009 - Commemorates 20 years of Slovakian Democracy. 2011 - Commemorates 20th anniversary of the grounding of the Visegrád Accord between Poland, Hungary and the (then) Czechoslovakia. 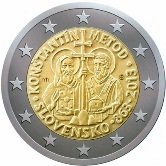 2013 - Commemorates 1150 Anniversary of the mission of Constantine and Methodius to the Great Moravia. 2014 - 10th Anniversary of joining the European Union. 2016 - Presidency of the Council of the European Union. 2018 - 25th Anniversary of the Founding of the Slovakian Republic. 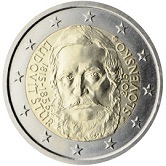 Return from Slovakian Euro Coins to Links to Specific Countries. Return from Slovakian Euro Coins to euro coin collector.